Loren Swartzendruber, president of Eastern Mennonite University (EMU), announced to the university community today that he plans to retire next year, on June 30, 2016, marking 13 years of leadership as the university’s eighth president and 33 years in Mennonite higher education roles. Prior to Thursday’s public announcement, Swartzendruber advised the EMU Board of Trustees at its fall meeting of his planned retirement. Dula said a national search for the university’s next president will begin in June, when the search committee is formalized. Board member Evon Bergey ’79, vice president of public sector operations at Magellan Health Services in Newtown, Pennsylvania, leads the search committee comprised of EMU board members and faculty, representatives of the Mennonite Education Agency, members-at-large and one student. In the context of nationwide challenges to institutions of higher education, Swartzendruber has guided the university, which includes a site in Lancaster, Pennsylvania, and Eastern Mennonite Seminary, toward growth and new opportunities. During Swartzendruber’s presidency, enrollment increased by 30 percent, from 1,436 students in the 2002-03 academic year to 1,870 students in the fall of 2014. More than 4,000 students have graduated from EMU since 2004. During his tenure, Swartzendruber’s support has contributed to the strengthening of core programs, including the cross-cultural study requirement; science, technology, engineering, and mathematics (STEM) studies with a focus on sustainability; the Center for Justice and Peacebuilding and its affiliated programs; and the seminary’s strong relationship with the United Methodist Church. Additionally, the Center for Interfaith Engagement was founded in 2009 to engage in collaborative multi-faith relationship-building. Swartzendruber also established and appointed members to the Crisis Management Preparedness Team in 2006 in response to worldwide concerns about a potential H1N1 pandemic. The team’s work was refined by realities following the Bluffton (Ohio) University baseball team bus accident and the mass shooting at Virginia Tech. More than $65 million dollars has been raised for annual operations as well as capital projects and endowment. New construction projects on campus include the Leadership in Energy and Environmental Design (LEED) gold-certified Cedarwood Residence Hall and an artificial turf field for soccer, field hockey and intramurals. Additionally, EMU purchased and renovated the 5,000-square foot Nelson Good House to accommodate students at EMU’s Washington Community Scholars’ Center, in the Brookland neighborhood of Washington, DC. In keeping with EMU’s sustainability initiative, the first phase of a two-phase solar power project was completed in a unique business partnership, contributing to significant cost-savings and sustainability targets. Additionally, older campus buildings have been renovated and repurposed: Elmwood and Maplewood residence halls, both LEED-certified; the addition of theaters, art gallery, coffeehouse and a media lab in the former gym of the University Commons building; and the Roselawn office spaces, consolidating department offices previously scattered around campus and accommodating the expanding Intensive English Program. More than $8 million has been raised in a $10.3 million campaign to renovate the Suter Science Center, with the laboratory portion of the project on track for completion by July. Serving alongside the presidents of area higher education institutions: James Madison University, Bridgewater College and Blue Ridge Community College. “I believe more than ever that the Anabaptist witness is needed in our fragmented world, and that we are called as followers of Jesus to offer our gifts in peacemaking and to build a more compassionate and sustainable world,” Swartzendruber said, adding that his years at EMU have affirmed a personal belief in education’s role in the continued call to faith. 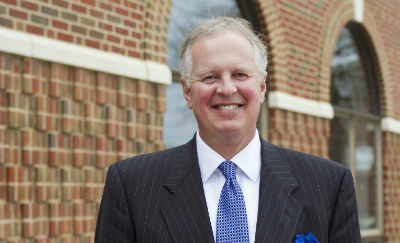 Swartzendruber’s leadership has been widely recognized among his peers at Council for Independent Colleges in Virginia (CICV), which represents 28 accredited nonprofit independent colleges and universities in Virginia. Jonathan Alger, president of James Madison University – a large public university in Harrisonburg, Virginia – notes that Swartzendruber “personally fostered relationships and projects on many levels and in many different contexts with JMU.” The two developed a personal friendship that dates from Alger’s arrival at JMU in 2012. A native of Kalona, Iowa, Swartzendruber holds a bachelor’s degree in liberal arts from Eastern Mennonite College, a master’s of divinity degree from Eastern Mennonite Seminary, and a doctor of ministry degree at Northern Baptist Theological Seminary. After graduating from EMU, he was associate director of admissions and part-time associate campus pastor. He was ordained in 1975, and served as lead pastor of Salford (Pennsylvania) Mennonite Church from 1978-83. Swartzendruber was appointed associate executive secretary of the former Mennonite Board of Education in Elkhart, Indiana, from 1983-93. He then served for 10 years as president of Hesston (Kansas) College. He is actively involved, on behalf of EMU, with CICV and the Virginia College Fund. Swartzendruber currently serves on the 14-member board of the Council of Christian Colleges and Universities, a higher education association of 181 intentionally Christ-centered institutions around the world. He also serves on the board of directors of the Evangelical Environmental Network and of the Southern Association of Colleges and Schools Commission on Colleges.